Enliven the spirit of Christmas with friends, family and colleagues. Sweetness of winter brought times to celebrate together, time to welcome future and time to say your thanks by sharing gifts. 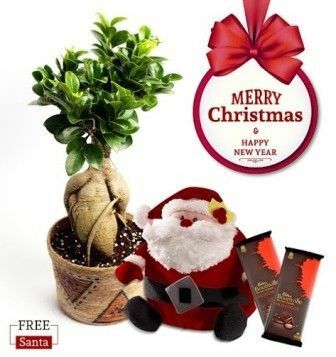 This arrangement of lovely Grafted Ficus Bonsai 2 years old, which comes along a Santa cap and 2 chocolates, will make for a perfect gift for your loved ones.